Sleek and sophisticated Geneva is surrounded by France and oh, so French! As the home of the United Nations, Interational Red Cross amongst 23 international organizations, its ppopulation is truly a mix of all Nations and its culinary options cover all cuisines. Centered around the beautiful Lake Geneva (Lac Leman), with views to spectacular snow-capped Mont Blanc (Europe’s highest peak), it is a breathtaking location. The Old Town with cobbled streets reminiscent of old Paris, is surrounded by chic shopping with perhaps the world’s largest collection of fine Swiss watch shops. 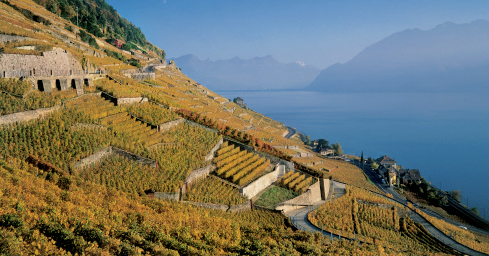 The slopes of the lake are lined with vineyards which produce the delicious Swiss wines that rarely leave the country. Opportunities abound here for exquisite French cuisine highlighting the local fish, meats, cheese and produce. Lessons with a gourmet chef, wine tastings at the vineyards or in private cellars, and of course,chocolate, chocolate, chocolate complete the experience. With its elegant cities of Zurich and Lucerne and countless towns and villages filled with houses covered in flowers, the majority of the country lies in this region. Its cuisine is influenced by its bounty gathered from the romantic lakes, peaceful rivers, rolling plains, high pastures and spectacular mountains. Each region has its flavorful local produce to offer including a variety of cheeses, wines, meat, game, fresh-water fish, fruits and vegetables, herbs, breads and pastries and, of course, chocolate treats. This is the land of the famous Swiss Fondue, roesti and raclette, along with endless variations of sausage and air cured meats. But here you can also enjoy fine Swiss cuisine prepared by chefs gathering Michelin stars. As you travel by train or car from Basel to Bern, from Interlaken to Zermatt, from St. Gallen to St. Moritz, your scenic views will inevitably include happy cows grazing peacefully on mountainsides and in valleys who produce that incredibly rich milk and cream which the Swiss magically transform into over 450 varieties of some of the finest cheeses and the most delicious chocolates the world has to offer. Wineries all over the region produce high quality whites and reds that the locals will proudly serve to visitors but prefer not to send outside their borders. Travel down to the southeastern corner of Switzerland and you’ll experience La Dolce Vita, Swiss style – the efficiency of the Swiss combined with the Italian lifestyle. Here Switzerland is steeped in the perfumes and flooded with the colors of the south as life goes on at a slower pace. Suddenly the menus are full of risottos, pastas and pizze and you are invited to dine lazily in the shade of a pergola, surrounded by lakes, cliffs, waterfalls and forests of chestnut trees. Here you need to take your time and enjoy life. Marvelous local products, including cheeses from the valleys are combined with magical ingredients into amazing risotto, luganighe, costine and other delights and served with their outstanding Merlot wines. Delicioso! Switzerland has long had a culture of fine cuisine and a reputation for making guests feel welcome. It started with the pioneer of luxury hotels, Cesar Ritz, in the 19th century and continues today with those who keep up with Swiss gastronomy at the forefront of the international scene. You are invited to savor the creations of the passionate chefs who practice their culinary artistry day after day. Let us prepare a delicious and flavorful itinerary for your 3-course visit to this incredible country. It's Still Winter in Switzerland! THE LODGE IN VERBIER, SWITZERLAND. Sir Richard Branson’s stunning mountain retreat, perched high in the Swiss Alps in Verbier, is a perfect year-round escape. The 13 friendly and experienced staff include a Necker Island trained General Manager, an activities co-ordinator, spa therapist, Raymond Blanc trained chef and Bam Bam – the chalet dog. Each one is dedicated to tailor-making each guest experience…. People may arrive as guests but often leave as friends. Individual rooms now available. Experience winter at The Lodge without hiring the whole chalet! We’ve got individual rooms available in March and April 2012 for 3, 4 or 7 nights. Exceptional meals and drinks, (plus champagne and all the usual inclusions!). The team can also organize all your transfers, lift passes, lessons and ski equipment for an additional cost. Verbier, “the resort that smiles at the sun”, and the second largest resort in the Swiss Alps, is a delightful French speaking village located on a sunny plateau, on the grand circuit of the “4 Valleys” ski area. Situated between the Matterhorn and Mont-Blanc at a height of 5,000 feet, Verbier has one of the largest skiing areas in Europe. Your lift ticket is honored at the 100 plus lifts and cable cars which service over 250 miles of ski runs. This vast ski area is topped by Jumbo, the Verbier-Mont-Fort cable car, with a 150 person capacity. Ascending to almost 11,000 feet, this telepherique opens up some of the steepest mechanically accessible ski runs in the Alps. Moderate to easy runs are plentiful and the “4 Valleys” 200 instructors are there to help you develop your skills. Verbier’s ultramodern sports center enables you to play tennis, squash, ice-hockey, curling, skating and swimming. Verbier has some 60 restaurants plus 9 nightclubs and pubs, and though sporty and active, appreciates an equally calm and relaxing atmosphere. For nonskiers, nearby cities such as Montreux and Lausanne are easily accessible by public transportation. Ask Trisha Iannazzi, your Swiss mountain specialist for more details. Trip prices are per person and subject to availability. SWITZERLAND - WHERE WINTER DREAMS COME TRUE!! SWITZERLAND – WHERE WINTER DREAMS COME TRUE! Not just in Hollywood do dreams come true! Switzerland’s mountain peaks offer everything for a fresh start into a prosperous year. Fresh powder, stunning vistas, fondue in a mountain hut, hot chocolate on the sun chair – it’s a winter wonderland! Massive amounts of fresh snow fell in Switzerland over the last weeks. With base depths of up to 13 feet, the conditions are excellent and promise a superb ski season. Looking for excellent skiing, snowshoeing, cross country skiing and more? Switzerland is the top destination and the place to be this season! Let us book your dream vacation in Switzerland. Breakfast buffet, themed 5 course buffet in the evening, drinks in the restaurant (soft drinks, beer on tap, table wine) during dinner. CALL IANNAZZI ENTERPRISES TO BOOK YOUR SKI VACATION. ANYWHERE IN THE WORLD THERE IS SNOW WE HAVE A GREAT PACKAGE! Switzerland – step into a world of indulgence. Switzerland offers its guests authentic experiences, from the sight of a spectacular mountain panorama to getting pampered in prestigious hotels. The magnificent five-star accommodations in our top resorts are the last word in luxury. Mystical bathing rituals, sensuous hammams, exotic massages and modern facilities – Swiss wellness destinations are committed to strive for superlatives. Joie de vivre between medieval castles and inspiring panoramas. A picturesque city with humanitarian tradition and cosmopolitan flair. SWISS Business Class features lie-flat beds with massage function. The Swiss Pass provides unlimited travel on trains, buses and boats. Welcome to the colorful Swiss autumn! We invite you to see Switzerland at its most sensuous and spectacular. Hike through landscapes bursting with color, join in the fun at a host of festivities, and taste exquisite wines and mouth-watering cheeses – of course, all made in Switzerland. Treat yourself to a well-earned break, and step into Switzerland’s colorful autumn.! 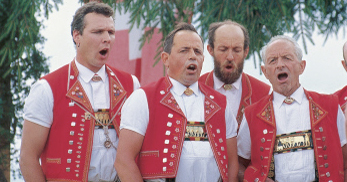 Feasts for the sensesThe Swiss autumn is packed full of colorful festivities, devoted to everything from alphorns and antiques to chestnuts, cheese – and of course wine. You’ll find centuries of tradition – and products of the finest quality. Take to the lake on a paddle steamerFondue cruises, jazz cruises, sunset cruises, cake cruises, even sushi cruises – Lake Lucerne’s fleet of historic paddle steamers offers a cornucopia of delights on the water. Learn the colorful secrets of the winemaker on this magical walk from Bienne to La Neuveville. At an altitude of 3,600 feet, walkers find themselves in Europe’s highest vineyard. The pretty terraces of vines along this walk are so precious they are protected by Unesco. the views from the Chasseral Nature Park are simply spectacular. Technology and tradition coexist happily here – as do people and nature. of the senses. Travel there in comfort on PostBuses. Beautifully adorned cows and happy farmers bring the delicious Appenzeller cheese down to the valley: the descent from the alp in Urnäsch is an unforgettable sight. the Fondation Beyeler in Basel offers insights into one of the most influential movements of the 20th century. A premier at the Kunsthaus Zürich: for the first time, aficionados of art can see one hundred masterpieces from this exceptional private collection all in one place. Call us to find out all the wonderful things we can arrange for you in Switzerland at this magical time of the year. An exclusive range of active tours with English speaking tour guides. The beauty of Switzerland, the European Alps and parts of Italy are discovered by international clients alongside our Swiss participants. Hiking/walking and cycling holidays designed for active travelers who take pleasure in exploring both the culture and the environment. Along with wonderful classics visiting unheard-of regions, far away from the mass tourism, and in line with current trends, we also offer more adventurous trek’s and cycle tours suitable for the fit and adventurous. Authentic travelling adventures thanks to typical accommodation and inclusion of local culinary specialities. Call us to join one of the scheduled group departures or create one of your own. As a Swizerland Network Certified Specialist, Trisha has traveled extensively in this amazing country and can organize a truly spectacular adventure for you, your friends or your family. SWITZERLAND is a small country, just twice the size of New Jersey, yet within its borders one can experience four different cultures; German, French, Italian and Romansch. As a Switzerland Network Certified Specialist, Trisha has visited many times and has been arranging fabulous vacations in Switzerland for clients for many years. Situated at the crossroads of Europe, it is easily reached and explored. Switzerland far exceeds all expectations with its colorful history, world-class festivals, intriguing cities, intact folklore, spectacular scenery and delicious foods . Everything in Switzerland is neat as a pin and it offers a broad choice of vacation experiences. Traveling around the country on the network of trains, post busses, and lake steamers is a dream. You need never drive a car in Switzerland. Just sit back and enjoy the magnificent scenery at every turn. In Switzerland, every winter’s day is a lovely day. Switzerland didn’t just invent the concept of winter vacations – it perfected it. 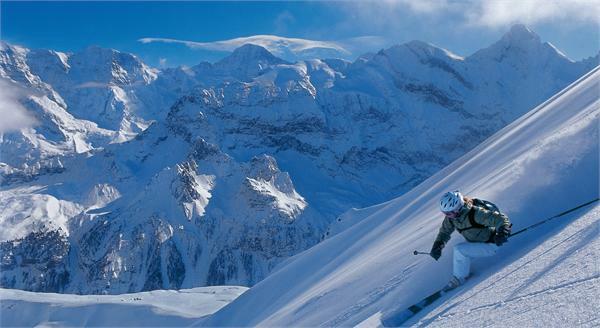 But Switzerland is truly a destination for all seasons as its delights (even skiing) can be enjoyed all year round.